Any time I try to exercise at home with my toddler around - she always ends up right next to me, squatting & side stepping along - and then right on top of me whenever I'm trying to do any floor work ("horse rides mommy, please"). 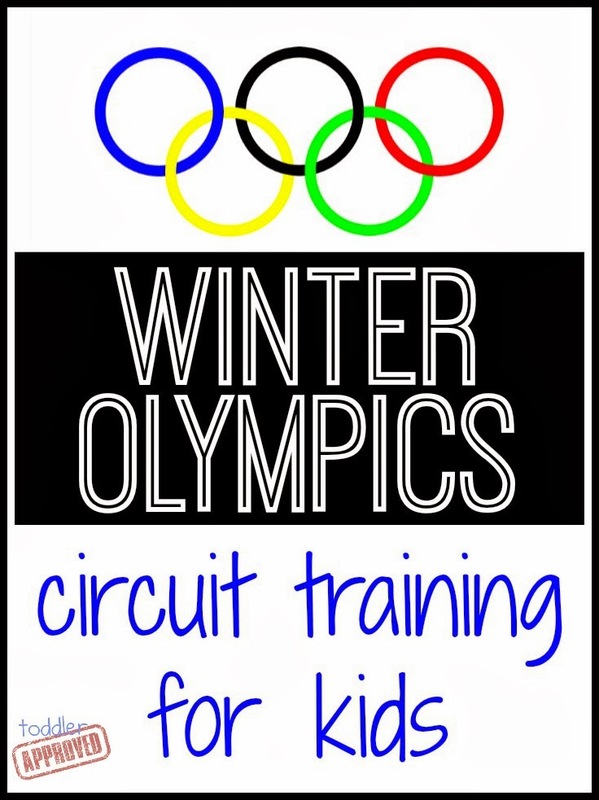 Today I created a Winter Olympics's inspired Exercise Circuit with my toddler in mind (and added a few things in it that would benefit me!). Be flexible - the length of time (or amount of times) you perform each activity is up to or gauged by your toddler. If they are really enjoying an activity, continue doing it until they start to lose interest. If they only want to try something once, move on to the next activity. Just keep moving & keep it fun! -Place a pillow on the floor near an empty wall. -Take the mattress off your toddler's bed and place it on the floor with a large stack of pillows and blankets next to it(If you allow your child to jump on or off of things - if not, ignore this step & the last activity of the circuit). If you made it through all of that - we're ready to start our . . . WARM UP - Carry the torch - Take turns carrying the torch as you walk or run around the house. When this is no longer fun for your toddler - spend a couple of minutes doing simple head to toe stretches (identify and have them repeat body parts as you stretch). Weave around your chairs (flag gates) in your best "Super G" form. When you come around your last gate (chair) move over to the jump rope and Slalom (jumping side to side over the rope) your way back the start. Repeat as many times as your toddler will let you. Stand at the side of one of the chairs (holding on if necessary) - extend one straight leg behind you, lean forward slightly, and extend the opposite arm (you both look as graceful as any figure skater, right). Hold for 5 seconds (count together) - now switch legs. To make activity more challenging - try holding pose with eyes closed, or try jumping when you switch legs instead of standing in between each pose. Stand behind and hold onto one of your chairs. Run in place as fast as you can (like a bobsled start) for 5 seconds - now run quickly to the front of the chair, sit in it and tuck in your body as if you are tucking into a bobsled. Go to next chair and repeat. When you have reached the last bobsled (chair), hockey skate (run with imaginary stick in hand) back to the start and repeat. Place a pillow on the ground near a wall. Stand on the pillow and squat as if you are snowboarding. Hold in the squat position while you place your weight on your toes and hold for a few seconds. Now shift your weight to your heels(still squatting) and hold for a few seconds (to mimic breaking in snowboarding). Repeat. Move to a hallway and take long cross crountry ski like strides down to the other end of the hallyway. On the way back - pretend you are releasing a stone (curling) while lunging, continue with walking lunges until you're back to the other end of the hallway and repeat the combo. Lay with your back on the ground in a "Luge" position. Have your toddler repeat the word luge, and explain that everytime you say the word, "luge", they are to return to that position. Now have them lay on their stomach (hands at sides) in a "Skeleton" position. Have your toddler repeat the word, "skeleton" and remind them that everytime you say "skeleton" they are to return to the skeleton position. Start standing and running in place - call out one sled position - see how quickly you can get into that position). Return to standing and call out another position. If you want to expend less energy doing this activity, you can simply stay on the ground and roll over to get from one position to the next. [If you do not permit your child to jump on or off of things in the house you may not want to do this activity.] Let your child jump on the mattress and come up with their best "freestyle" moves. They will also love practicing ski jumping from the mattress to the stack of pillows/blankets. While they are working on their freestyle & ski jumping moves, you can work on freestyle and ski jumping arms. Lay on the floor on your stomach. Start with your arms close to your sides, palms down. Forehead on the ground the entire time. Pinch your shoulder blades together and lift your arms & hands a few inches off the ground. Hold for 5-10 seconds. Keeping shoudler blades pinched together, palms down, arms & hands off ground a few inches - extend arms out to the side and hold for 5 to 10 seconds. Now bring arms overhead (shoulder blades pinched, palms down, arms off ground) - 5 to 10 seconds. Rest and repeat. Cool Down - Medal Stand - Create a medal stand using your ski jumping pillows. Have your toddler climb to the gold medal podium, place the medal around his/her neck. Stand next to your toddler - together, take a deep breath in and lift your arms to the sky (celebratory pose), exhale while dropping your arms down in front of you, bend at the waist and take a bow. Love this activity? Check out our other favorite Olympic activities for kids here. Great idea! We love doing circuit workouts! I will have to find a time for this next week. What a cute "workout"! Seems like a fun way to get exercise, and kind of an overview of the Olympic sports too! Pinning!